Its been quite a few days since the new samsung galaxy s8 was released, a few of you might have it in the first place but having a beautiful phone is just not enough. So we took some time to dig up the best looking theme and live wallpaper for the beautiful Samsung Galaxy S8 and S8+. Presenting ‘Glitzy – Real Glitter Live Wallpaper’ to you. The app has a lot of customizable live wallpapers, all of them being shiny and glittery. 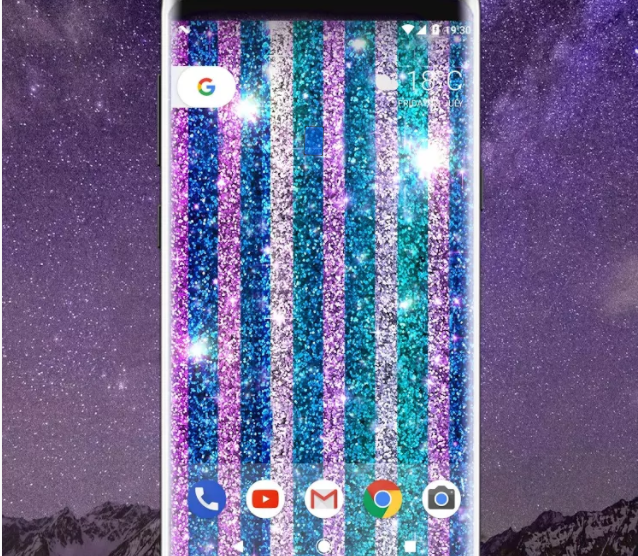 The wallpapers definitely fit the Samsung S8 devices as it has dual edges or the infinity display which suits very well with such glittery wallpapers. The application costs around $2 in Google Playstore but there a quite a few ways to get it free none of them being perfectly legal. We can just give you the surface information but you will have to download it from the third party websites and we don’t recommend that.